eBay Find of the Day: Foo Dogs! That's Random: Anyone Watching "Shear Genius"? Cool Tool: Etsy "Shop by Color"
Have you heard about SUM Design? The line was created by graphic designer Susie Mendive, whose last job was Art Director at Stila Cosmetics. “I often found myself creating a pattern for a new makeup collection and thinking, wow, I wish I could have this exact look on a set of sheets!” Mendive has said. 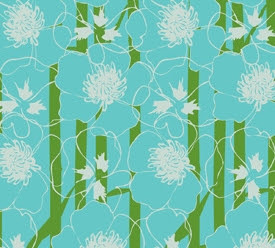 Since that epiphany, Mendive has rolled out three fresh, feminine, and graphic hand-screened wallpaper patterns ($98 to $250). 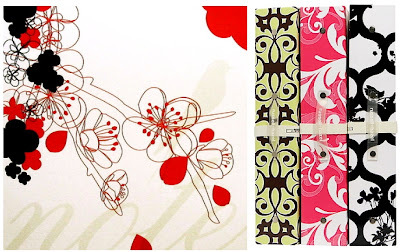 Mendive also created a collection of pillows, storage boxes, serving trays, and other home decor items ($20 to $95) that reinterpret the company's cornerstone Floral Femme Fatale paper (above left) in the original black or green and brown colorways. All are available from SUM's online store. 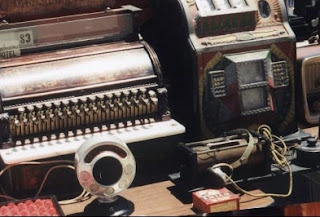 After you hit the Oakland Art Murmur on Friday night and the Art Deco & Modernism Sale on Saturday, treat yourself to a visit to the Alameda Point Antiques and Collectibles Faire on Sunday, June 3. 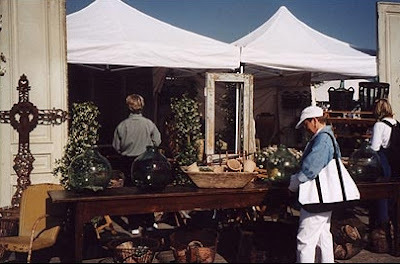 I have to admit that I feel like the super-stylish and talented Victoria Smith (aka sfgirlbybay) sort of owns blogging about the Antiques Faire. (Read her tip-filled write-ups here). 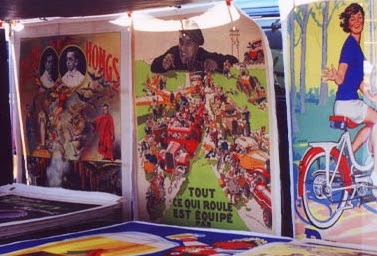 Still, I've been haunting this giant flea market almost every month for years now, and I can't let the weekend pass by without encouraging anyone within reasonable driving distance to check it out. Held the first Sunday of each month, the Faire boasts more than 800 vendors, many of whom travel hundreds of miles to man their booths. The wares on display range from fun and funky tchochkes for a couple bucks apiece to pristine, sought-after vintage and antique furniture for hundreds of dollars and up. Among the booty I've snagged there: An antique carved wooden Asian screen ($15), vintage blown-glass wine jugs and green glass seltzer bottles ($10 each), French linens, lab beakers that I use as vases ($5 each), a vintage metal birdcage ($5), barkcloth yardage, silk brocade curtain panels from the 1940s ($50 for the set), McCoy pottery ($10 and up), a rewired French silver-and-glass chandelier ($85), a weathered circular mirror mosaic ($50), a pair of sunbleached deer antlers ($3) ... seriously, I could go on and on. Most months, though, I don't actually buy much. I just like to wander around people-watching, collecting ideas, and enjoying a churro or a gyro from one of the many food booths while soaking up some sunshine by the water. 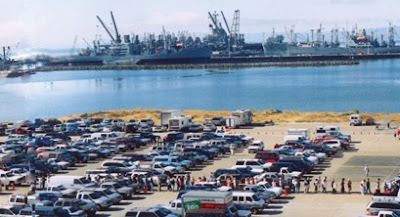 If you need any more incentive to go, consider this: Sunday is the very last time that the event is being held at the decommissioned Alameda Point Naval Air Station, which has absolutely breathtaking vistas of San Francisco and the Bay. On clear, sunny day -- which, fingers crossed, this Sunday will turn out to be -- you feel like you can literally reach out and touch the Bay Bridge and the skyscrapers of downtown San Francisco. (My favorite line about the East Bay, stolen from erstwhile Oakland mayor Jerry Brown, is that "It's closer to San Francisco than San Francisco." Take a stroll around Alameda Point and you'll see how true this is.) 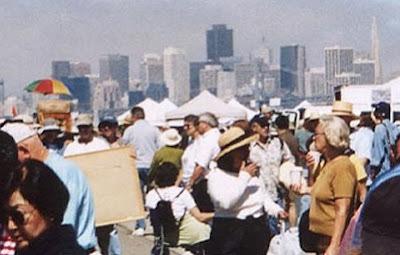 Next month, the Antiques Faire moves to a nearby spot along the Oakland Inner Harbor. The gates open at 6 a.m. for serious treasure hunters willing to fork over the $15 "early entrance" fee. The price drops to $10 at 7:30 and to $5 at 9 a.m. I like to get there on the early side -- though I've rarely made it before 8 -- just so I can beat some of the crowds and feel confident that I haven't missed anything really great before someone else snapped it up. But you can arrive at just about any hour before the vendors start packing up at 3 and have a lovely time wandering around, looking for bargains, and gathering inspiration. 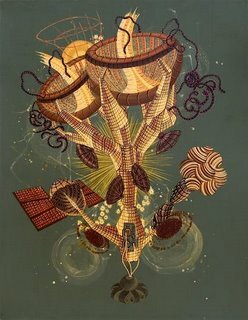 Oakland painter, illustrator, and graphic designer Chris Pew is a bit of an anomaly: An artist with a scientific mind. 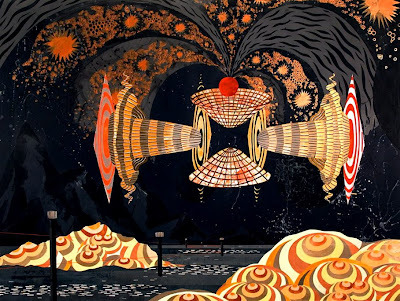 In his art, Pew strives to visually express abstract scientific theories -- and whether you understand the underlying concepts or not, the results are wild and absolutely mesmerizing. 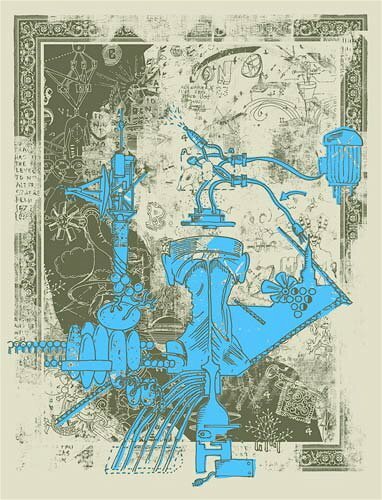 Pew's work is available through his own online shop, from the Beholder, and at San Francisco's Receiver Gallery, where a joint exhibition with sometime collaborator Paul Urich runs through June 1. Prices start at $20 for prints, while originals range from a few hundred dollars for pen-and-ink drawings up to $2,000 for large paintings. Find out more about Chris Pew here. 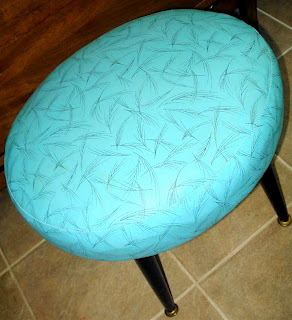 sessed with turquoise right now? This Saturday and Sunday, June 2 and 3, mark the summer edition of the twice-a-year Art Deco Weekend by the Bay. 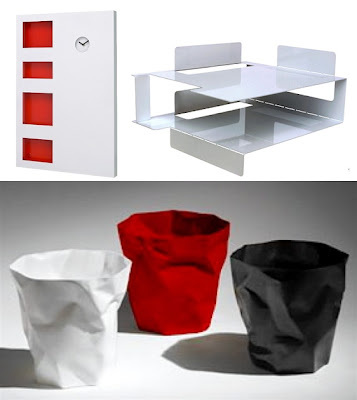 through-Swinging Sixties furniture, lighting, textiles, accessories, jewelry, and clothing. 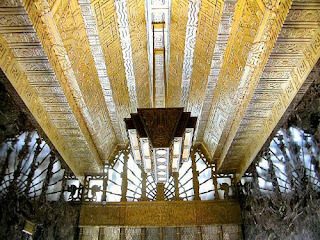 Round out the experience by taking a guided walking tour of San Francisco's Art Deco landmarks (including 450 Sutter Street, below) or a docent-led tour of Oakland's grand Paramount Theatre, right. Cap off the weekend by getting your jive on to swing and big-band jazz at Berkeley's Ashkenaz. For more details on the weekend's events, click here. The arrival the other day of the latest CB2 catalog, coupled with my recent post about West Elm's new offerings, got me thinking: At what point does furniture "inspired" by midcentury design classics cross the line to outright mimicry? Top left: CB2's Odyssey Table ($149); top right: IKEA's Docksta Table ($149); bottom: Eero Saarinen's iconic 1956 Tulip Table ($3,150 at Design Within Reach). 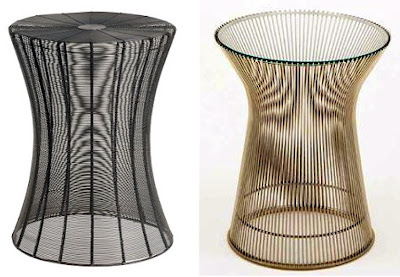 Left: CB2's Tornado Table ($119); right: Warren Platner's 1966 Side Table ($662 at Highbrow Furniture). Left: West Elm's Patterned Veneer Coffee Table ($349); right: Milo Baughman's Burl and Chrome Coffee Table ($3,400 at 1stdibs). 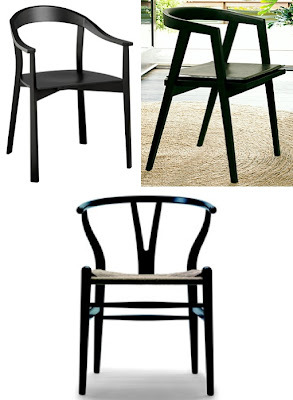 Top left: CB2's Hippie Arm Chair ($229); top right: West Elm's Round Back Chair ($199); bottom: Hans Wegner's 1949 Wishbone Chair ($499 at House of Copenhagen). 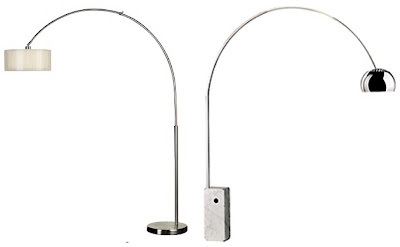 Left: CB2's Double Dip Lamp ($199); right: Achille Castiglioni's circa-1962 Arco Lamp ($2,448 at DWR). Left: West Elm's Sphere Pendant ($99); right: George Nelson's 1947 Ball Lamp ($299 at Velocity Art and Design). 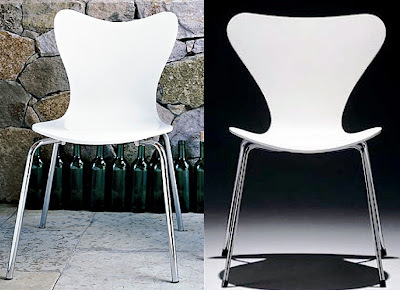 Left: West Elm's Molded Desk Chair ($149); right: Charles and Ray Eames' 1948 Molded Plastic Armchair ($279 at Highbrow Furniture). 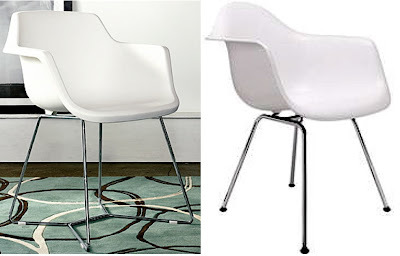 Left: West Elm's Scoop Back Chair ($79); right: Arne Jacobsen's 1955 Series 7 Chair ($394 at Retro Modern). 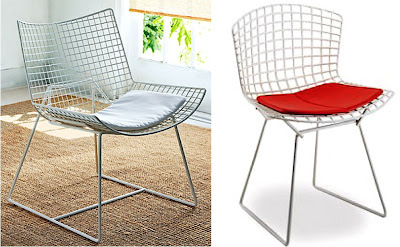 Left: West Elm's Wire Mesh Occasional Chair ($229); right: Harry Bertoia's 1952 Side Chair ($483 at Hive Modern). 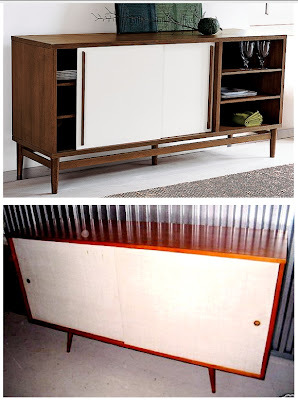 Left: West Elm's Modern Storage Console ($599); right: Paul McCobb's 1950 Planner Group Credenza ($1,000 on eBay). Clearly, these mass-produced knockoffs are more than "inspired" by the originals. Is that theft, or flattery? Would you rather spend thousands of dollars for a vintage, signed original or a licensed repro, or a fraction of that for a decent (if somewhat dishonest) imitation? 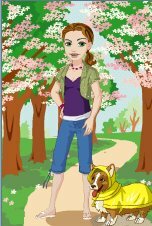 Personally, I'm more in the gimme-the-knockoff camp than the nothing-but-the-real-stuff crowd. 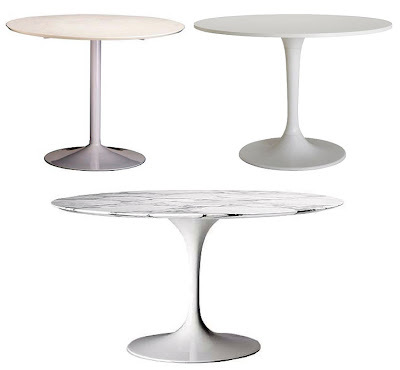 If I stumbled on a mint-condition Saarinen table at a garage sale for $100, I'd be all over it. But, barring that, I don't have $3,150 for a simple white table (and I'd think twice about dropping that kind of cash even if I did) -- so I own the $149 IKEA Docksta. I feel a tiny bit guilty about it, but I'm not losing sleep at night. 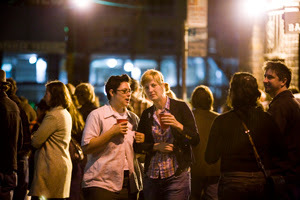 Mark Your Calendar: Oakland Art Murmur's "First Friday"
Don't miss the Oakland Art Murmur on Friday, June 1. 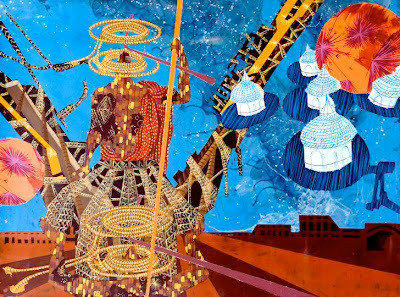 On the first Friday evening of each month, galleries and artists' collectives in and near Oakland's newly bustling (but still edgy) Uptown area open from 7 to 10 p.m. for the coalition's monthly art walk. Participants include Rock Paper Scissors, Blankspace, Boontling Gallery, Rowan Morrison, 21 Grand, Creative Growth, Mercury 20, and Front Gallery, among others. 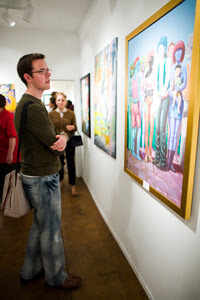 Affordable art is a key part of the mix: Original pieces by emerging artists can be had for as little as $20, while work from more established painters, illustrators, photographers, and sculptors runs several hundred to several thousand dollars. Oakland has long been an artists' haven, but in recent years the art scene has exploded as high costs have pushed droves of working artists out of San Francisco in search of more affordable studio space. 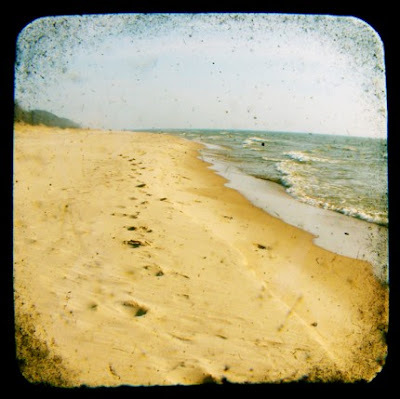 I liken it a bit to the arts pilgrimage from Manhattan to Brooklyn during the last ten years. (Indeed, Oakland is reputedly second only to New York in number of artists per capita.) 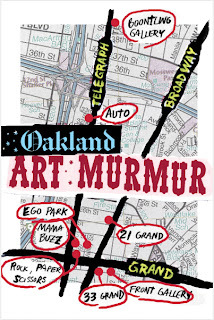 The Oakland Art Murmur was born last year to showcase this growing local arts community. 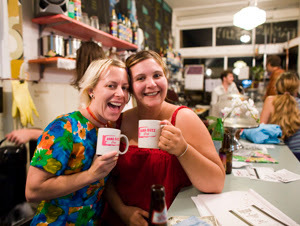 So grab a coffee, a beer, or a bite to eat at Mama Buzz Cafe and then stroll from art space to art space. Among the artists exhibiting this month are Chris Truman, Carl Auge, Alexander Cheves, James Gouldthorpe, and Moira Murdock. Don't miss 21 Grand's "Small Works" fundraising sale, which features works from dozens of local artists, all priced at $100 or less. Bring a lawn chair or a blanket, too, and settle in for Asphalt Shorts IV, a series of short films about cities and urbanism that's being screened in the Broadway parking lot between 21st and 22nd streets at 8:30. You're also likely to catch a drum circle, a bonfire, a guerrilla art performance, or a busking band amidst the milling students, hipsters, and art aficionados on the street. It's a happening Happening indeed. 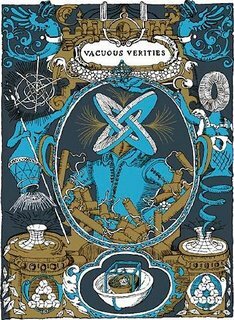 Info, directions, and details here. I'll be back with fresh posts on Tuesday morning. Until then, have a good one! 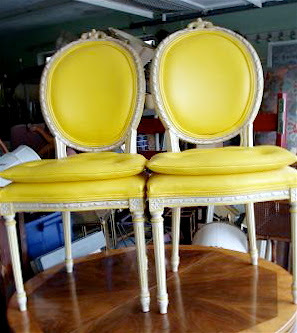 The form of these Louis XVI-style chairs is haute French glam, but the colors are pure California sunshine. They'll add a hint of humor to a modern dining table and a dash of sophisticated symmetry flanking a tall dresser. 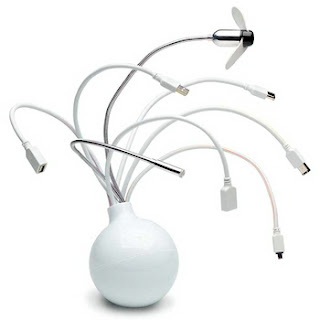 Ora-Ito's The Hub, above, lets you plug in up to six USB and FireWire devices at once and also has a fan, a light, and an AC adapter. $90 at A+R. 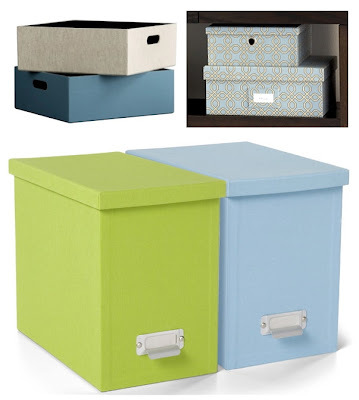 Top left: CB2 Open Storage Boxes, $20 each; top right: West Elm Trellis Print Storage Boxes, $24 and $34; bottom: Container Store Library Desktop Files, $26 each. Left: Binth Notepad, $16; right: Russell + Hazel Pattern Binders, $24 each. Top left: Target File Folders, $16 for nine; top right: Cavallini File Folders, $15 for 12; bottom: Spiro File Folders, $5.50 for six at The Container Store. Left and center: Kassett Magazine Files, $4 each; right: Lingo Magazine Files, $4 for five, all at IKEA. Left: Russell + Hazel Butterfly Clips, $20 for two; center: Karim Rashid Micro Garbini Cans, $3 each; right: Crate & Barrel Memo Clips, $5.50 each. 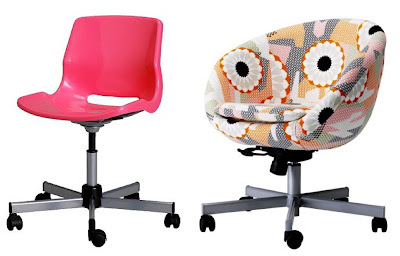 Left: Snille Chair, $20; right: Skruvsta Chair, $139, both from IKEA. Top left: Jagga Writing/Magnetic Board, $25 from IKEA; top right: Blu Dot 3D In/Out Box, $29; bottom: Bin Bin Wastebasket, $50, at Velocity Art + Design. Left: CB2 Titanium-Finish Trig File Cabinet, $149; center and right: Expedit Bookcase, $179, and Helmer Drawer Unit, $40, both from IKEA. OK, seriously, people -- back to work now. Because there's absolutely no reason that your design fixation, love of color, and all-around excellent taste should be confined to your home, these great new offerings (and old favorites) from See Jane Work are a convenient excuse to bring some of that fabulous style to your workspace, too. 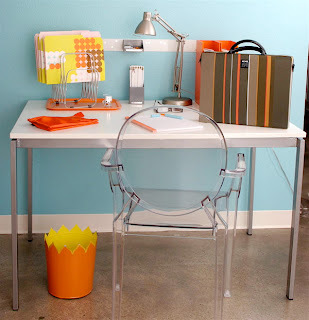 Go ahead -- call it "Cubicle Chic." 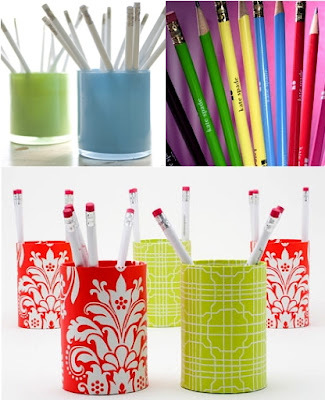 Top left: Sanibel Pencil Cups, $10 each; top right: Kate Spade Pencil Set: $8 for six; bottom: Thomas Paul Pencil Cups, $6 each. 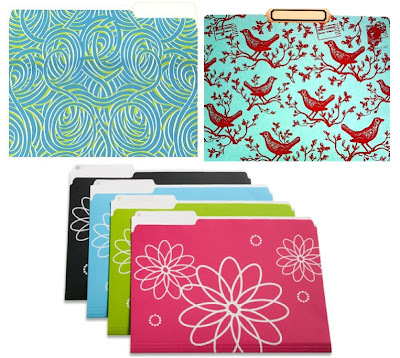 Left and center: PepperPot File Folders, $7 for six; right: Caspari Print File Folders, $12 for six. Left: Letter Trays, $28 each; center: Pocket Strip Wall Organizer, $25; right: Magazine Files, $24 each. Left: Thomas Paul Notebook Trio, $18.50; right: Mirage Journals, $9 each. Left: Chrome Stapler, $25; center: Silver Tape Dispenser, $25; right: Silver Calculator, $28. Left: Superdeluxe Monogram Paperweights, $65 each; right: Acme Studios Card Case, $29, and Rollerball Pen, $63. Left: Angela Adams Organizer, $23; center: Decorative Things Desk Tray, $40; right: PepperPot Mouse Pads, $7 each.